After having 14 years of experience in the medical industry as well as significant practice in the international market of medical products, we developed a strong impulse to create a professional and exclusive quality range of medical supports and bandages for orthopedics, gynecology, rehabilitation, sport and home use. As a result of our joint cooperation with medical practitioners, engineers and businessmen, we have created a thoroughly verified assortment of medical goods under MedTextile® brand. The MedTextile`s brand portfolio includes in-demand bandages as well as bandages with special purposes. Its current line of bandages is constantly being tested and improved based on the recommendations of leading experts. Our production is based on most recent studies performed by leading experts in the fields of orthopedics, traumatology, gynecology, physical therapy and rehabilitation. The best quality, design and affordable price make MedTextile products competitive in any market. MedTextile’s range of medical goods delivers complex propositions to hospitals and pharmacies and it proves to be a success in the mass market: internet shops, supermarkets and other sales channels. The bandage production factory, Technomedica Llc., is located in the Ukraine. The factory specializes in the manufacturing of medical goods for support, rehabilitation and comfort. Technomedica is equipped with modern equipment from a well-known Swiss company JAKOB MÜLLER A.G. Cyclical turnaround is integrated into the process flowsheet, including all stages from drafting and raw materials manufacturing to the output of the finished products. The quality is inspected at every stage of the manufacturing process. 100% of the finished products go through a final stage of quality control according to the pre-production samples. Technomedica implements the Quality Management System and conforms to the international standard protocols ISO 9001:2008, Certification ISO 13485:2003. The manufacturing process is further certified with the European standards – Conformite Europeene (CE). 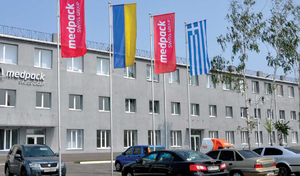 MedTex Swiss Ltd., a new bandage production factory, located in EU. The factory specializes in the manufacturing of medical goods for support, rehabilitation and comfort. 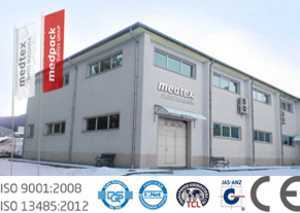 The MedTex Swiss Factory is equipped with modern equipment from leading manufacturers. The factory implements the Quality Management System and conforms to the international standard protocols of ISO 9001:2008. The manufacturing process is further certified with the European standards – Conformite Europeenne (CE). The main advantages of MedTex Swiss Factory are its good location, high standards of quality, modern high-tech equipment, advanced technology and wide selection of products.